As an organless, skinless being, Skully is able to travel very light. As he packs his spare arm away he says to himself “Alberta was great – but it’s time to move on”. He slams his suitcase shut and announces, “Next stop – Ontario!”. This Burlington restaurant began trading in 1919 while Emma Byrens and her husband were the owners. In 1952 Emma retired and sold the business on but in recent years Emma seems to have returned. She appears floating in a white dress throughout the building. People have witnessed moving objects and toilets flushing by themselves. Is it the case that Emma believes she still works here? This haunted spot featured on the TV show Creepy Canada. 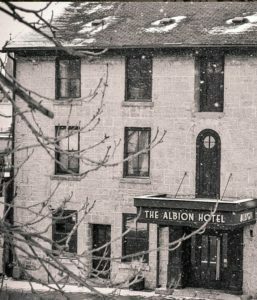 Legend has it Al Capone was once a visitor of The Albion Hotel. On this night, he became acquainted with a woman who went on to become his mistress. Just after she became a resident of the hotel she was found dead. To this day nobody knows why she died. Employees insist they can feel her spirit in the form of a push on the shoulder followed by a rush of cold air and the sound of her high-heeled shoes. This location has an air of mystery to it. Rock Castle, also known as Rannoch Lodge, has stood in Hamilton, Ontario since 1848. Multiple visitors to the castle have reported feeling sudden cold temperatures and hearing unexplained voices. Little is known about why this could be, but that makes the castle an even more interesting visit. If you are looking to have the living daylights scared out of you. This is the place for you. Make your way into one of the many areas that will be sure to make you jump. 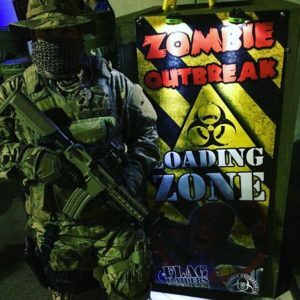 Or get more hands on and join the activities on offer such as Paintball Zombie Hunt. Just remember, this place’s sole purpose is to scare you. Think you can hack it? Head along after September 29 to see whether you can handle this level of horror. Do you have plans to visit any of these places? Halloween Alley stores opened in many of these towns in 2018. We had ten Halloween stores open across Ontario. Perhaps we’ll see you in Barrie, Brantford, Cambridge, Hamilton, Kitchener-Waterloo, London, Milton, Pickering, Sarnia or Windsor for Halloween 2018!